Situated in Switzerland’s Bernese Oberland, Murren sits above the dramatic Lauterbrunnen Valley. Originally a farming village, it was ‘discovered’ by British winter tourists at the beginning of the twentieth century and began its journey to becoming the destination that it is today. The best places to stay in Murren offer a comfortable stay and easy access to all the local amenities. And many enjoy a central location, and easy access to the lifts, which is a bonus both in winter for skiers and in summer for walkers heading up the mountains. During the First World War refugees based here awaiting repatriation constructed the early resort. In 1924 the Kandahar Ski Club was formed by Sir Arnold Lunn and the world’s first downhill race, the ‘Roberts of Kandahar Challenge Cup’, instituted. Murren has come a long way from the Swiss farming hamlet. 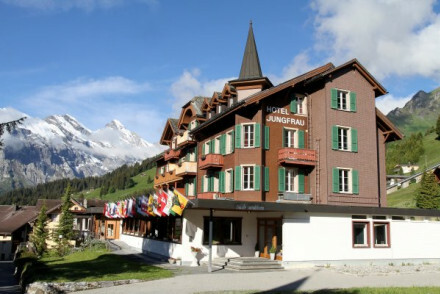 It is reachable only by cable car and then narrow gauge railway (with spectacular views of the Eiger, Monch and Jungfrau mountains) and so is charmingly free of automobiles, but you'll not miss out on any other modern comforts if you book one of our recommended hotels here. Over the years, with further development and the increasing popularity of winter sports, Murren has become one of the ‘must go’ European resorts. By the 1960’s it was extremely fashionable - the James Bond film ‘On Her Majesty’s Secret Service was largely shot here and is memorable for the scenes at ‘Piz Gloria’ - the revolving restaurant on the summit of Schilthorn which doubled as Blofeld’s hideaway. Skiing and the other winter sports - skating, cross-country skiing and curling - remain ever popular, but the summer season brings its own delights. Murren is great for walkers, mountain bikers, painters etc. Ski the stunning Schilthorn, a 1.3lm long piste with great varied terrains and the most stunning views. In the summer months head off hiking up the Allmendhubel, the Blumental Pan or along the Via Ferrata to marvel at the stunning scenery and panoramic views of the area. Thrill-seekers will love going paragliding through the Lauterbrunnen Valley! The 007 Walk of Fame is full of memorabilia and photos from when they shot On Her Majesty's Secret Service on the top of Schilthorn mountain. A fascinating spot. Head along to the beautiful Sprutz Waterfall or to the Trummelbach Falls, which are both loveliest during the summer. Use our guide to the best places to stay in Murren and start to plan your visit whether you're coming to ski or for the glorious summer walking and biking. 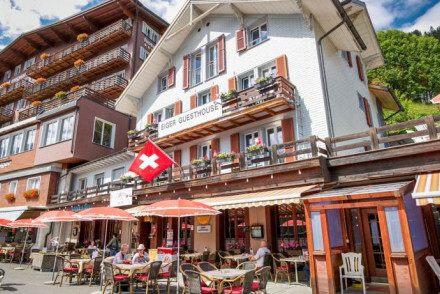 Hotel Jungfrau is a family-run hotel with light and spacious rooms, a restaurant, swimming pool and all mod cons. 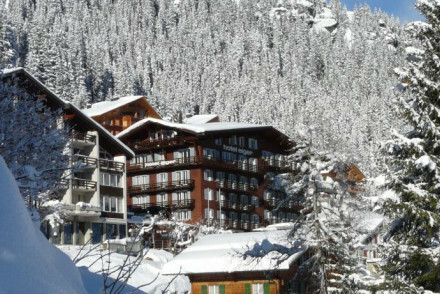 Its balconies and terrace enjoy panoramic views over the valley, there are apartments which are perfect for families or larger groups, and it's bang next door to the ski school. Blumental Hotel boasts typically Alpine style accommodation in a chalet style. Located right in the centre of town and set amidst beautiful gardens, guests also receive free access to the public ice rink during the winter. Hotel Alpenruh is a good value option in the centre of town, located just a short distance away from the many local activities on offer, and right beside the Schilthorn Cableway - so very easy access to the slopes. Their spacious and comfortable rooms offer great views whilst there's also a sauna and a top restaurant. Hotel Eiger, Murren is an upmarket choice, with lovely bedrooms and uber modern bathrooms as well as two restaurants to choose from. Come back after a long day out to unwind in their wellness centre and feel utterly rejuvenated! 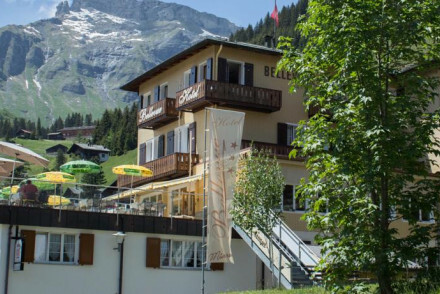 The Hotel Bellevue is a charming alpine style hotel right in the centre of Murren. The rooms are pretty and the views of the Eiger, Monch and Jungfrau are stunning. Eiger Guesthouse offers simple accommodation with bold colours and private terraces. Ideally situated for hitting the slopes and reasonably priced, there's also regional cuisine served up. With bunk beds and family rooms, it's a very decent option. If you're here for the skiing then obviously you need to come during the winter months, from late November until early April. If you want to avoid the crowds though then don't come around Christmas, New Year or February Half Term - January may be your best bet. The average daily temperature climbs to 18°C in July and so this is the perfect time to come experience Murren in the summer. There may be some tourists around at this time, however it's not nearly as busy as in the winter. International visitors can either fly into Bern Airport or Zurich Airport. SkyWork offer direct flights from London City to the former, whilst Easyjet, British Airways and Swiss Global offer direct flights from Gatwick, Heathrow and Luton to the latter. The journey time is typically just under two hours. From either airport, you can easily hop on the train to Lauterbrunnen station which is located just outside Murren. Browse through our list of the best places to stay in Murren. A charming small hotel in the quaint village of Murren. Simply designed rooms with bold colours, sink-into beds and private terraces. Enjoy hearty regional cuisine at the restaurant, and unwind in the cosy bar after a long day outdoors. Reasonably priced and close to the slopes. Ideal for families. Active Holiday - A geat base for adventure enthusiasts with skiing, hiking and mountain biking being only some of the activities on offer. Families - With bunk beds and family rooms, this well priced and placed hotel is ideal for a family getaway. Great walks - In the summer months there are miles of hiking trails with stunning views. Blumental Hotel is the perfect base to make the most of Mürren's winter skiing and summer hiking. 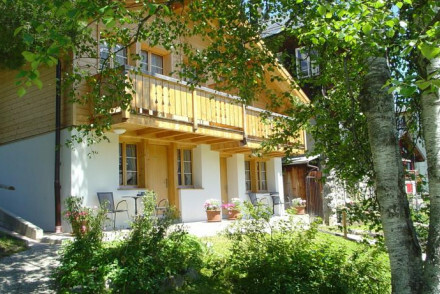 This family-run property offers spacious rooms decorated in a light and airy chalet style. With a beautiful garden its charming hosts create a friendly atmosphere. Superb location in the centre of town. The Bellevue is a charming Alpine style hotel in the centre of Mürren. The pretty rooms offer fantastic views of Eiger, Mönch and Jungfrau mountains. The on site restaurant serves typically Swiss cuisine and wines, in the dining room or on the lovely terrace. Unwind in the library or sauna. Country Escape - With views of the Eiger, Mönch and Jungfrau mountains it's the perfect spot to soak up Murren's mountainous beauty. Families - Ideal for a family getaway with plenty of room to run around and children's books and DVDs. Great walks - Hike up the various local mountains and soak up the stunning views. Good-value hotel in the car-free resort of Mürren. Spacious rooms have wooden panelled walls with excellent views. Sauna, and access to nearby health centre with indoor pool and hot tubs. Excellent restaurant with focus on seasonal dishes. Skiing - Located adjacent the Schilthorn Cableway station, you're in prime position for easy access to Murren's slopes. An elegant alpine lodge with epic mountain views. Seriously comfortable rooms boast uber modern bathrooms, sink-in-to beds and private balconies. Two restaurants serving regional cuisine and a cosy bar for post activity indulgence. A wellness centre completes the Alpine perfection. Skiing - There are 52 km of pistes in the Mürren-Schilthorn area to be explored. 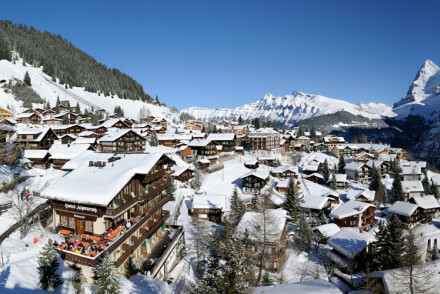 Three star hotel in car-free Swiss ski resort of Murren. Light and comfortable rooms and family apartments available with private balconies looking out to Jungfrau mountain. With a swimming pool, restaurant and bar. Located next to the ski school.